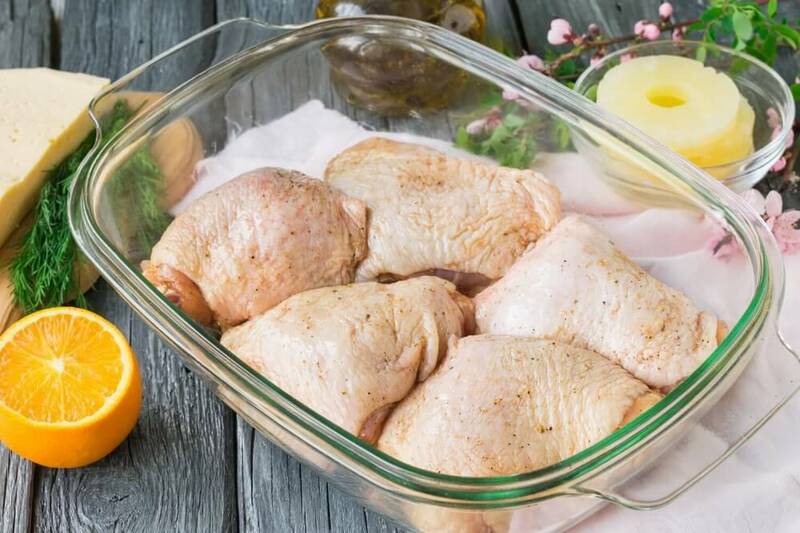 Chicken dishes have long been popular due to their taste and low caloric content. Today we will prepare a recipe that is perfect for a festive table. 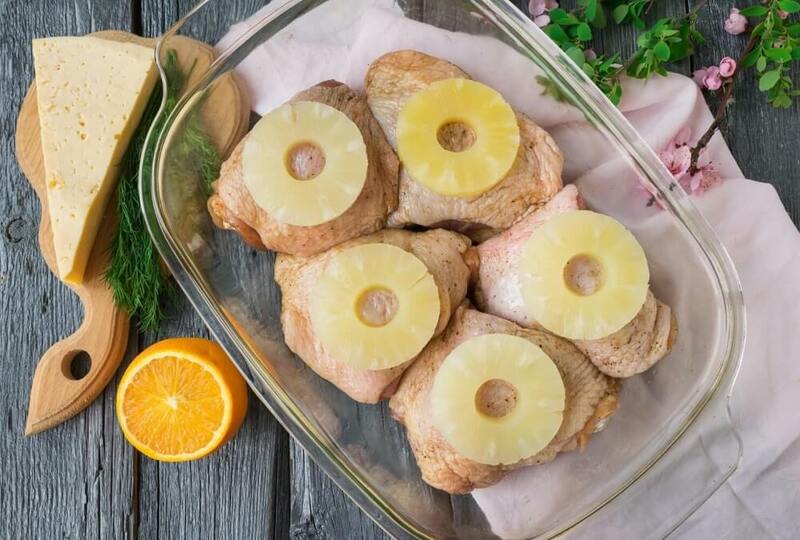 We will bake chicken thighs with canned pineapple and cheese in the oven. Marinated in orange juice and soy sauce, the chicken turns out to be especially juicy and fragrant. Rings of canned pineapple give the meat a special piquant note. 1. 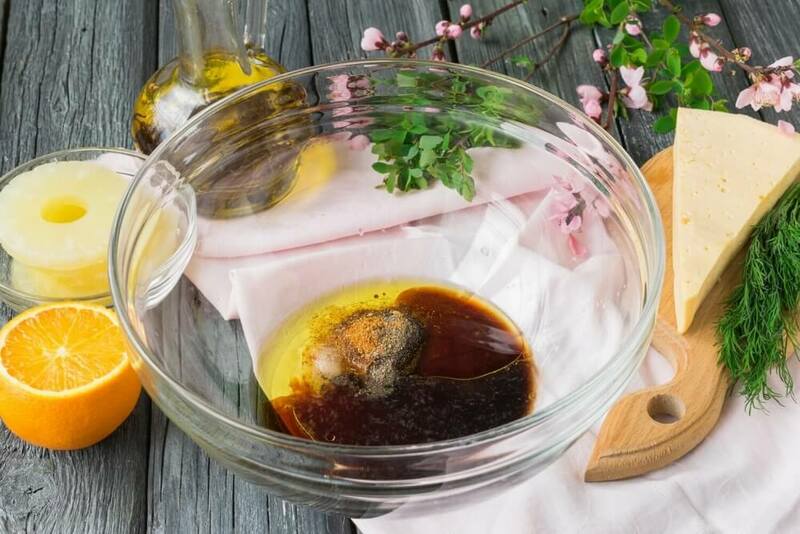 Combine the ingredients for marinade in deep dishes: classic soy sauce, refined olive oil, orange juice and spices. 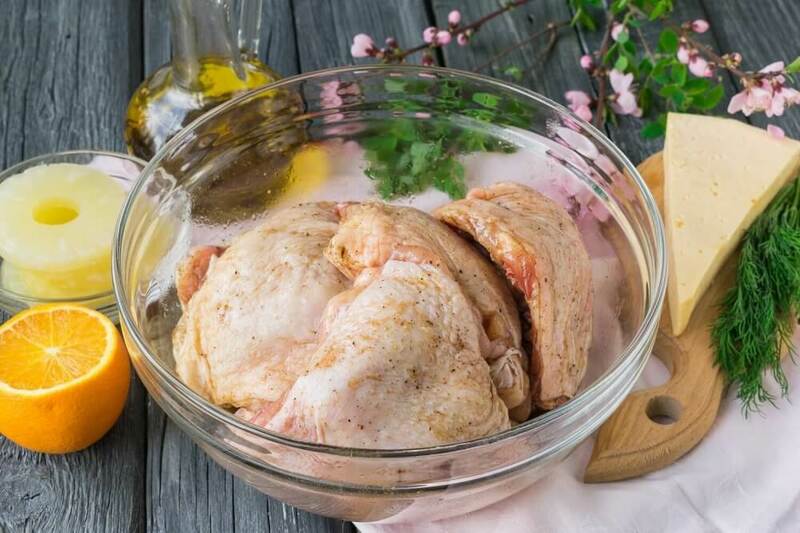 For the recipe, you can use already prepared mixture of seasonings for chicken or individual spices to taste, for example, ground coriander, paprika, dried basil or thyme. Add a little salt, considering that the soy sauce is also salty. Carefully mix the marinade. 2. Prepare the meat. Pre-unfreeze chicken thighs at room temperature. Wash the meat under the running water, dry with the napkins and clean it. Put the prepared chicken thighs in the dishes with the marinade. Mix the ingredients so that the meat is completely covered with the marinade. Leave the chicken for at least 30 minutes to soak up the aromas of spices. 3. When the chicken thighs are marinated, put them into a deep, heat-resistant form. 4. Lay a ring of canned pineapple for each piece of meat. 5. Crush a piece of hard cheese on a large grater. 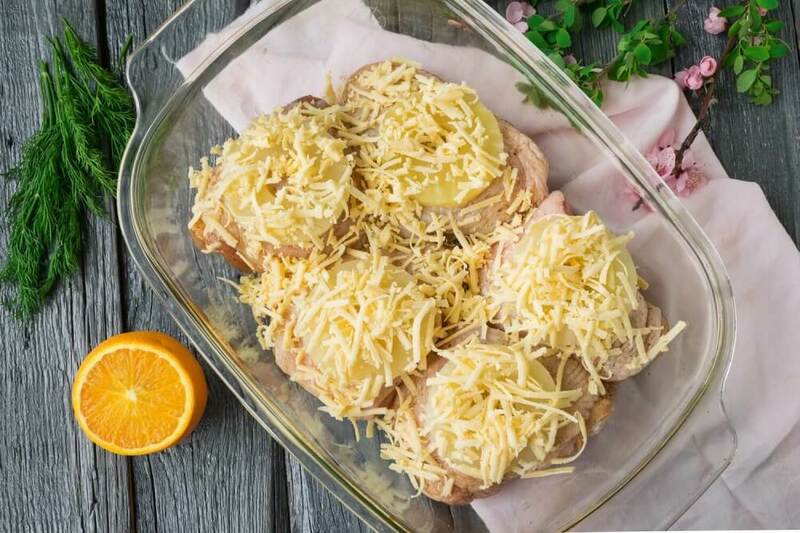 Sprinkle each slice of chicken with grated cheese. Cover the heat-resistant shape with a lid or food foil. 6. 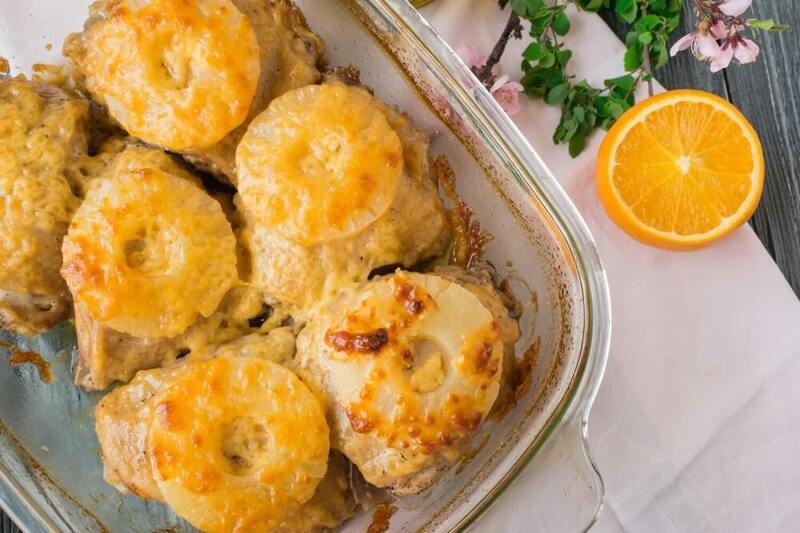 Put the form with chicken thighs in a preheated oven to 200 degrees. Bake the meat for 40-50 minutes until ready. Check the readiness of the meat by stabbing it with a knife. If a transparent juice flows from the chicken, it is ready. 7. 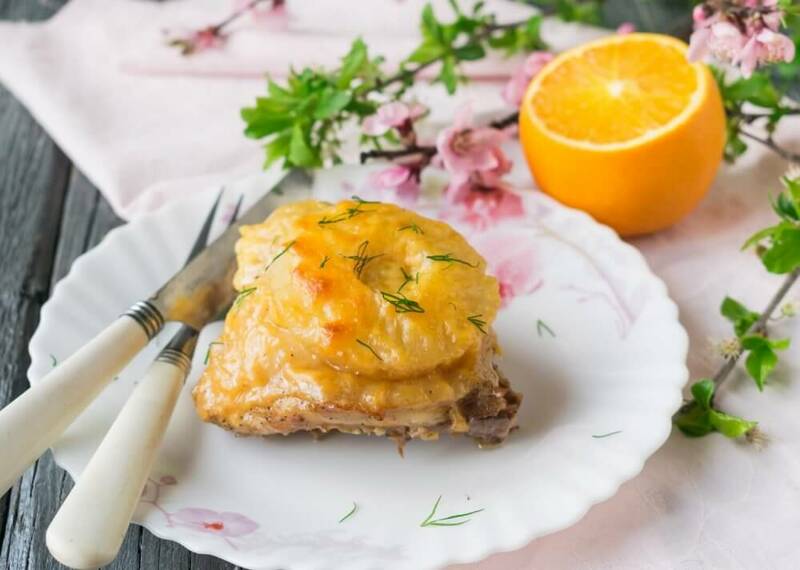 Serve finished chicken thighs with pineapple under the cheese hot, decorating with fresh herbs. 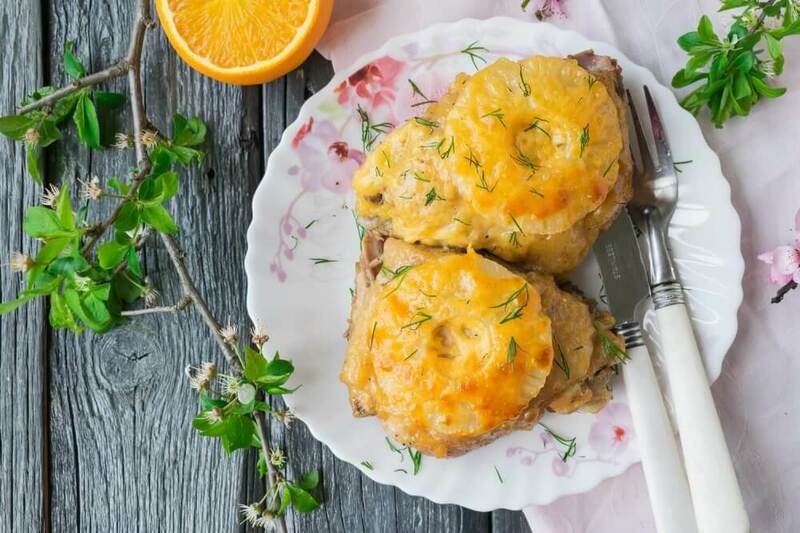 As a side dish, a potato, rice or a salad of fresh vegetables are suitable.